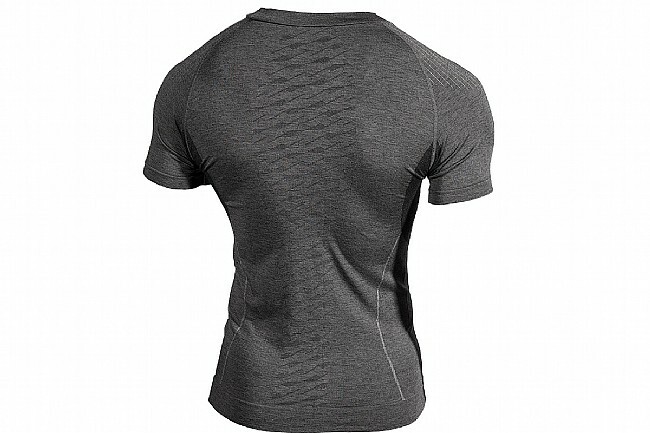 This Showers Pass Body-Mapped Short Sleeve Base Layer has been designed with open-knit vents down the back and under the arms to keep you operating at optimum temperature. They've used the same construction used for making socks to knit these breathable patterns while maintaining an itch-free seamless torso. The 4-way stretch fabric is warm, odor-resistant, and supremely soft thanks to a fine-tuned blend of Merino wool, modal, spandex, and nylon. For comfort, the garment features a wide hem and raglan sleeves, making it suitable for cycling or any other outdoor activity. Great base layer for wide-ranging weather. This baselayer wicks the sweat away from the rider on the hottest days, and yet provides an extra layer of insulation when the temperature begins to dip. It was very comfortable against the skin and not too bulky. I tried it out around Lake Tahoe and it proved to be a bit like a Swiss Army knife... something I could wear early when the temps were cool, and continue to wear as the day went on and the temps began to heat up. I like this underlayer shirt. The snug fit takes the chill off when heading out on cool mornings. The breathable fabric doesn't feel stuffy when the temperature warms up. The material moves with me so it is not at all restrictive. Love it. Wool doesn't stink, fit is snug and stretchy. Doesn't chafe. Wicks. Wicked baselayer, Dude. I ordered a ML which should be 42 to 44 inch chest - I have a 39 inch chest and it fits quite snug, not complaining other than the size chart is off by one size, definitely size up one size for a snug fit, I probably could have used a Large XL too and got by with it fine. (knocked off one star for the miss on sizing) I've used in cool cold weather and it performs well in that environment - will have to wait to next year to test it in heat. I've known Showers Pass since it was started here in Humboldt County. The new owners have expanded quite a bit, this is my first SP baselayer and I'm going back for more when it show's up in Leader's Club or Daily special. Since the weather here is rarely hot enough for a sleeveless baselayer, I usually wear Pearl Izumi, which I like a lot. The SP seems to work better in a wider range of temperatures than PI and, so far, the fabric doesn't hold body odor and holds its shape (I got a ML, I'm 5'9 155 and it fits well) after several washings. I have not tried this in the rain yet but I find it comfortable with just the right amount of compression and warm. It allows sweat to wick away. It drip dries quickly and does not seem to hold onto odors. I plan to use this in the rain and also in the winter as an additional layer to keep me warm. Great weight, fit is tight but stretchy material is comfortable, and I love the long torso length - at 6'5, shirts are often to short. The XL fits nicely. I got this on sale and decided to try it. I bought it to wear as a base layer under cold weather gear and it seems to work fine. I realized that after I bought it, it's intent is for warm weather riding. Seems to work great for the cold weather stuff, in my opinion. I'd get another if they still had my size at the sale price. It's form fitting with some degree of stretch to it. I wear an XL and the XL I bought seemed true to size. Feels comfortable next to skin. A very nice product. Good body conforming base layer. I had planned to wear this as a casual tee. But at 63 and 175lbs. (Im athletically thin) the LXL is too tight aesthetically as a casual tee. However, the shirt is identified as a base layer and in that intended role, it performs perfectly. The shirt is comfortable, easy to move in, long waisted, and just what you expect from Merino in terms of breathabiility and not getting stinky. I usually wear a medium tee for a trim, but not skin-tight fit. This shirt is designed to fit more snugly and works great as baselayer under a cycling jersey or under a long-sleeved XC ski kit. Excellent fit and function. Great value. A must for comfort on any long ride. This base layer keeps you cool when hot and warm when cold. Wicks sweat perfectly and a must for any serious rider. This base layer is perfect for cold weather. Really makes you feel warmer. Great fit and perfect for a 45degree day. Wore this under a long sleeve jersey on a mild winter day. Should be good through the spring. Great undershirt for the cool spring weather or add a long sleeve for Winter. These are really tight, I ordered XL for my 5'8 154pound body and it is very snug. Great shirt, just rode Vail Pass in 45 degree weather with this and a long sleeve undershirt and a Castelli long sleeve jersey in comfort, even with intermittent snow and rain. Keeps you warm and keeps you cool, how can it be? I'm not sure but adding a base layer has increased my comfort range on long rides where I start out cold but warm up with exercise and ambient temperature. I really like the Showerpass base layer. Works as a great wind barrier and keeps my core a consistent temp. Seams are flat and no skin irritation. I would recomend this! 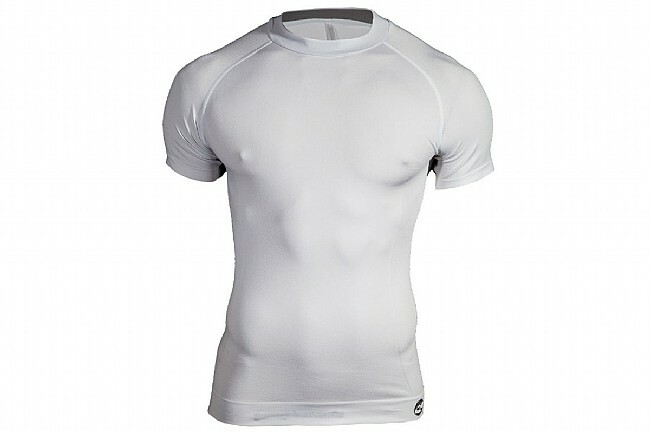 Excellent form-fitting baselayer that works very well. I highly recommend this. I have worn this base layer in temps from 39 to 78 and felt great. Helps in the cool mornings and still feels good later in the day when the temps are up.